SRTS Guide: What's Wrong With This Picture? Following are a number of photographs to help identify the types of problems that children may encounter on the trip to or from school. These examples focus on some of the most common problems, many of which are easy to correct. If these problems are addressed and obstacles to safe walking and bicycling routes are eliminated, more parents will allow their children to walk and bicycle to school and children will be safer doing so. 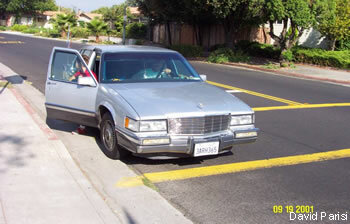 Motor vehicle is stopped in the crosswalk and in the red (no parking/stopping) zone. The red curb paint is faded. In addition, most states require all crosswalks to be white. 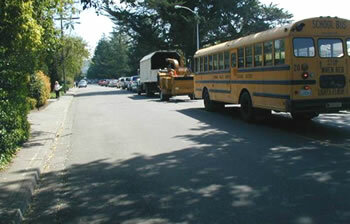 This picture was taken in California, where yellow is used for pavement markings in school zones. This picture was taken one block from school. The sidewalk abruptly ends, forcing children to walk in the street, and visibility is obscured at the corner by the bushes and fence. In addition, most states require all crosswalks to be white. 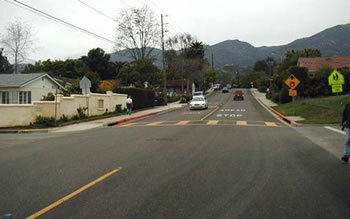 This picture was taken in California, where yellow is used for pavement markings in school zones. Tree root damage has pushed sidewalk up. The sidewalk is angled greater than the 2-percent ADA requirement, and the lifted section presents a tripping condition. There is no paved sidewalk for these students to use, and the rolling terrain can ‘hide’ children walking in the street. Bushes are growing over the sidewalk. This car is parked on the sidewalk. 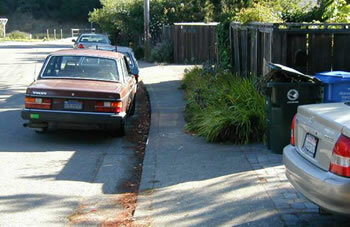 Not only does this cause pedestrians to walk in the street, it will damage the sidewalk. This is a damaged multi-use pathway with cracks in the surface and debris on the trail. 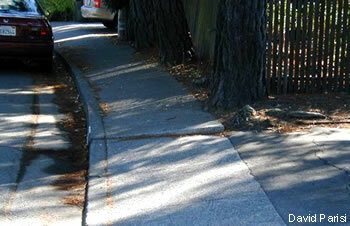 The cracks are an obstacle for walkers, bicyclists and particularly people in wheelchairs. 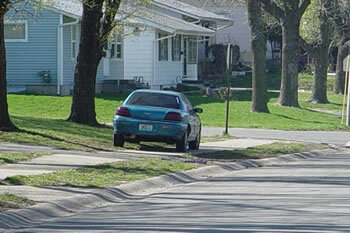 The driver entering this street, just before the school crosswalk, is likely looking left for oncoming motor vehicles and may not see the pedestrian or the crosswalk to the right. 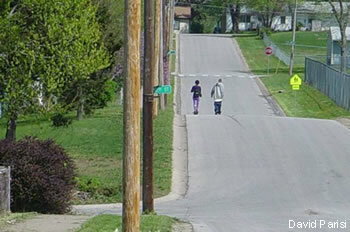 The amount of traffic on this busy street is prompting this child to dart across. In addition, most states require all crosswalks to be white. 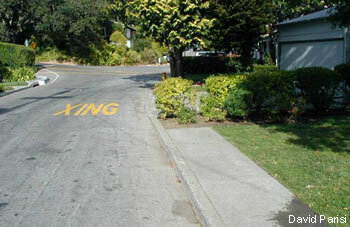 This picture was taken in California, where yellow is used for pavement markings in school zones. This empty bicycle rack is broken and is not a recommended design. 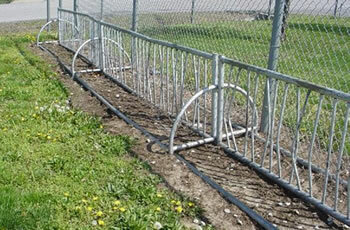 It is difficult to lock bicycles to this rack and keep them in an upright position. It is also not a well-placed rack. Only one side is useable. Hedges block access to the sidewalk at the end of this school crosswalk. There is no curb ramp, and the bushes block access to pedestrians in wheelchairs and any other students attempting to cross. In addition, most states require all crosswalks to be white. 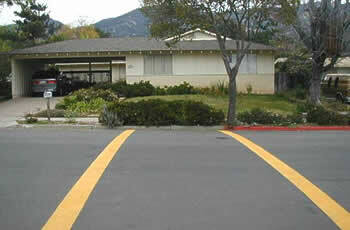 This picture was taken in California, where yellow is used for pavement markings in school zones. 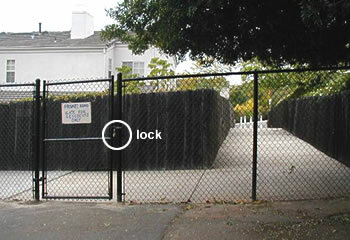 This gate and lock were recently installed by neighbors to block access to their private road. 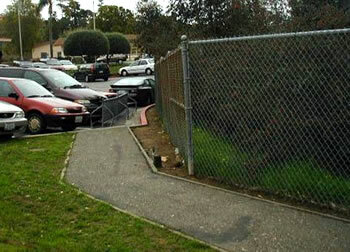 The locked fence also blocks access to the sidewalk that leads to the school. This is a pathway off a sidewalk at a school. The pathway ends at a parking lot, and is blocked by parked cars. There is no sidewalk for students to cross the parking lot and walk to the school buildings. The bicycle rack is poorly placed and inaccessible. This is a well-marked school crosswalk with advanced warning signs. (Note the back of the sign in middle of the image.) However, school children must walk 10 to 12 feet into the travel lane, while in the crosswalk, before they can see approaching traffic. In addition, most states require all crosswalks to be white. 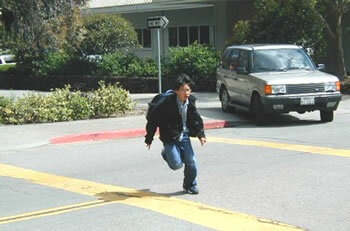 This picture was taken in California, where yellow is used for pavement markings in school zones. Thiswell-marked school crosswalk has good signage, but there is a discontinuous sidewalk on the right side and no curb ramps. In addition, most states require all crosswalks to be white. 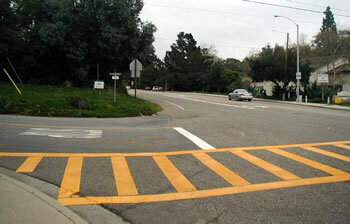 This picture was taken in California, where yellow is used for pavement markings in school zones. This is a long line of motor vehicle traffic for drop-off and pick-up of school children. The sidewalk on the left side of the street is narrow and almost entirely blocked by overgrown bushes.